Let me tell you a bit about myself. I’m Kevin Dautremont and I am the husband of a gorgeous wife and the father of four wonderful kids. 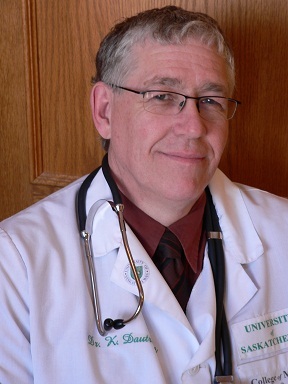 I am a family doctor in Moose Jaw, Saskatchewan, Canada, and besides practicing medicine I like to write. In 2008, I recieved an award as “The Best New Canadian Christian Writer” from The Word Guild and Castle Quay Books for my novel “The Golden Conquest”. In 2011 a short story I wrote was included in the anthology “A Second Cup of Hot Apple Cider” (edited by NJ Lindquist and Wendy Nelles). Writing is a learning process for me. Besides self directed learing, I have attended His Imprint Write’s conferences in Saskatoon and The Word Guild’s conference in Guelph. I took the Craftsman Course and Residency from the Christian Writer’s Guild with Jerry Jenkins. I also keep reading. A lot. The most important thing in my life however, remains my faith in Jesus. I became a Christian in 1982 and through my struggles and errors have learned to rely on the grace and goodness of God. Without Him, I can do nothing. But if I trust in Him and follow His leading all things are possible. The same is true for you. Yes, I was involved in the YC’s. In fact, I served as Senior Leader for a year or two. Unfortunately, I’m not on Facebook, (due to lack of time). However, my wife is so I’ll get her to check it out. Thanks for the information and for commenting. I only prescribe methadone and only to a small number of patients living in the area. Pretty awesome. We are so privileged to have you as our Doc. I came across my first Cider book this summer. Didn’t really gravitate towards it at first (though I’ve long known of the series.) Then, gave it a second go recently, deciding to start with a fiction piece this time. Read your ‘Dazed’. Oh my gosh, it was good. VERY good! Truthfully, when I put the book down that time, I said to myself “I could read this kind of story all day, everyday.” (Only slight exaggeration. Gotta’ work in there somewhere, too.) Then I found myself daydreaming about an anthology filled with short “life problems and true faith” stories, such as yours so skillfully reflected. And thanks again for weaving together such a skilled, ‘truly alive’ story that also reflects rich, yet simply conveyed, spiritual truth. Thanks so much for your kind words. I also have a short story in the anthology “Christmas with Hot Apple Cider”. Have a blessed day.